Simon Trumper, one of the UK’s top players and 2004 winner of the European Omaha rankings, has announced that he has secured an exclusive deal for the World Series of Poker with online poker site, Purple Lounge. Purple Lounge was launched in November 2005 and is a member of the Prima Poker network of internet poker rooms. It describes itself as a niche market and offers its members information on celebrity happenings and places to go, eat and be seen. “When I first spoke to Purple-Lounge, it was to do a standard sponsorship deal over six months but quickly we both realised that doesn't fit their profile as a prestigious site; instead, they contacted me and said ‘pick your top three events you would like to play at this years WSOP’. I looked at the schedule and decided the choice would be, apart from the $10,000 Championship Event, that I would like to play the only other $10,000 event, the Pot Limit Omaha (that I came 5th in last year) and one of the two $5,000 No Limit events; either the normal No Limit or the Short-Handed. In the end, I chose the Short-Handed as I think it will be the best players and will suit my style of game. “Purple-Lounge agreed with my choices and therefore I will be representing them throughout the WSOP and look forward to raising their profile to all the players as well as the world’s media. Simon Trumper first came into the public eye with his successful appearances in Channel 4’s superb groundbreaking poker series’, Late Night Poker. He played all six series, winning both his heat and the final in series 2, and finishing runner-up in series 4 beating the likes of Dave Colclough, Ram Vaswani, Pascal Perrault, Phil Helmuth and Kevin O’Connell in the semi-final, losing only to the late Hemish Shah in the final itself. The good news for fans of that programme is that it looks to be returning with the slightly changed name of “Late Night Poker Masters” with a considerable injection to the prize fund from Party Poker. Simon will also be commentating at the second series of Late Night Poker Ace which first made its appearance last year to great acclaim. 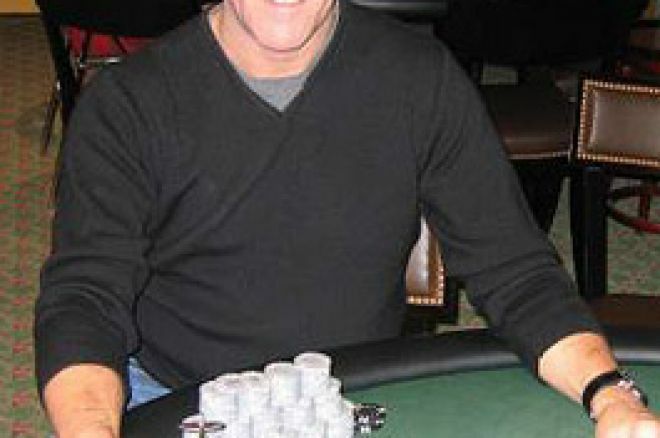 UK Poker News wishes Simon Trumper the best of luck in Vegas!